Wanderlust dreams...captured earlier this year when we went to Bermuda (discussed HERE and HERE). Happy August! I, for one, am awestruck by how quickly the summer has flown by; in less than a month, I'll be back to lecturing, this time in a new job (more on that forthcoming). In the meanwhile, this perennial homebody has been experiencing a bit of wanderlust, and, like may of you, will be embarking on a couple rounds of travel in the coming weeks. Although packing has never been my strong point (I like to be prepared for absolutely everything and the heft of my luggage reflects that absurd objective), I have discovered a few shortcuts during my last few trips that have streamlined my efforts, one of which not only lightens my load but looks chic in the process! The *Maison Francis Kurkdjian Globe Trotter. In my adult years, I have grown appreciate the diversity of mood and mentality that fragrance affords. Ever rotating through trusted favorites and fresh procurements, my dresser top is a veritable sea of flacons, each holding their own distinct energy. Despite their wonder and transformative potential, taking these potent perfumes with me on vacation is not particularly realistic. Enter the *Maison Francis Kurkdjian Globe Trotter: this sculptural masterpiece is the quintessential fusion of form and function! How is it already August?! Makeup details from this image later in the post. 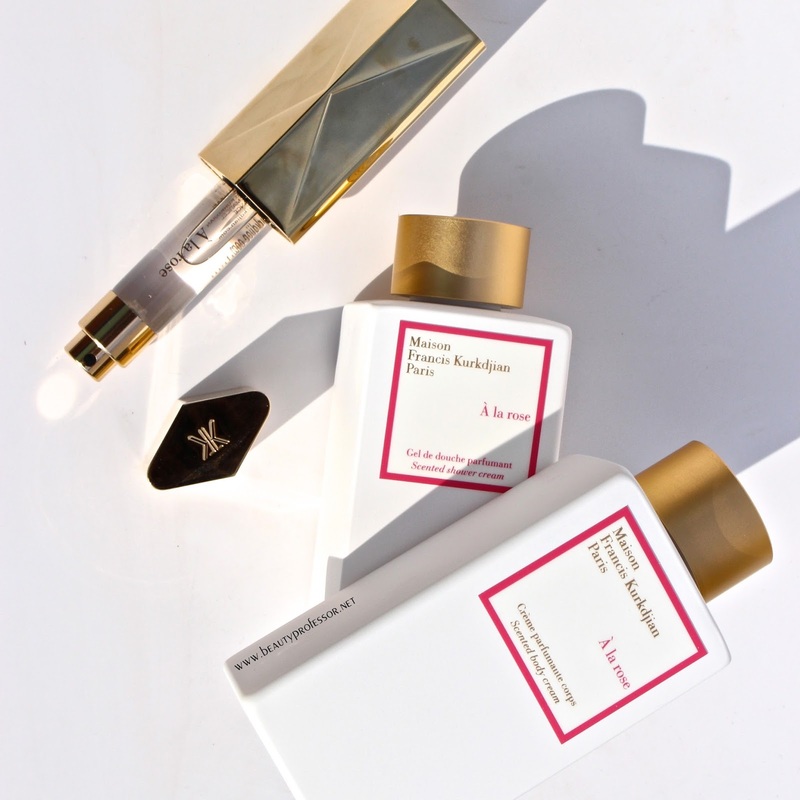 The Globe Trotter...pictured with the decadent *Maison Francis Kurkdjian Shower Cream and Body Cream in A la rose. Designed for those who seek a luxurious experience with fragrance, even when living out of a suitcase, this opulent metal case effortlessly coordinates with the genius travel-sized options from Maison Francis Kurkdjian--everything from the timeless and classic APOM Femme to the singularly sensual OUD Discovery Collection comes in the refill trios--for an endless array of perfume options that won't send your beloved luggage over the dreaded 50 lb mark. I prefer to start by inserting one of the .37 ounce refills in OUD Silk Mood (reviewed HERE) into *The Globe Trotter for my intial day of travel as it is unique yet wearable in close quarters and then pack a vial of both the Aqua Universalis--excellent for a sunny daytime jaunt--and the intoxicating Lumiere Noire Femme for nights on the town. With the triune of travel vials collectively weighing in at about an ounce, *The Maison Francis Kurkdjian Globe Trotter enables pared down packing and a host of options. Streamlined success? Yes, please! The richness that is Uma Paro. 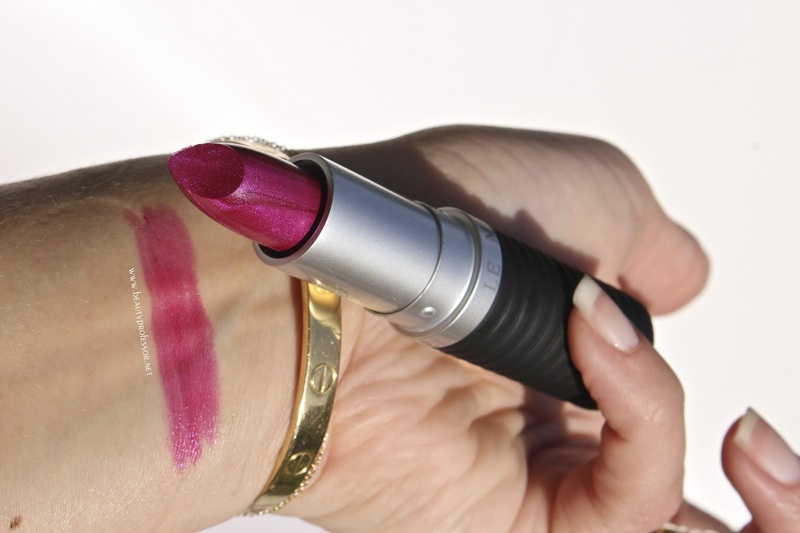 A swatch of Le Metier de Beaute Uma Paro in direct sunlight. Bottom Line: I hope your August--whether rife with travel or drenched with the relaxation that comes from staying close to home--is an enjoyable one and that you found this packing shortcut, courtesy of Maison Francis Kurkdjian, a helpful one! Do you have travel planned for the imminent future? What are some of your favorite ways to streamline your packing efforts? Do share! Love the color of lipstick! Beautiful color. Thank you, Venice...it's a Le Metier de Beaute classic!